At a lean 64 minutes, Dumbo strikes me as Disney’s most narratively lacking yet emotionally trying of films; at least of its era. Dumbo also serves as one of Disney’s most flagrantly abusive films – there’s a true sense of outsider-ship to the proceedings that really marks the film as something more then it lets on. Our mute title character is the center of abuse and repression as a result of his appearance. His large ears serve to cast him as the other, despite the general aura of innocence that he conveys. 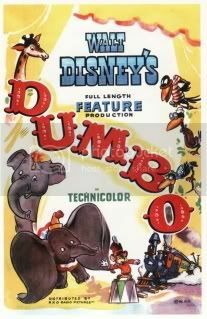 The social chastising that Dumbo encounters hits a soft spot in my heart, but at the same time, one has to analyze the social consequence and purpose of such an assault. Is it done strictly out of appearance, or is there a level of nuance behind such reprehensible banishment? There isn’t a clear cut answer to the why of it all, but I can say with a certainty that the various questions that Dumbo poses elevates the material as a whole. 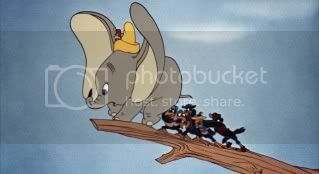 Given that it simply is, Dumbo’s alienation provokes deep-rooted sympathy and understanding by virtually all audiences, in that the little elephant with big ears trumps Jesus Christ himself in the innocence department. The mute elephant deals with his “disability”, gets himself in unwanted trouble, and needs the love of his mother to keep him going. The banishment on behalf of the other elephants of the circus tent comes across as purely malicious and serves to give the whole film a much darker edge. Even Dumbo’s alcohol induced fantasy carries a weight of innocence. While there are certain undercurrents to the whole film that suggest a homosexual commentary (there are pink elephants after all), I don’t buy the film as a critique of homosexual tolerance. No, the film seems to suggest the importance of a nuclear household, or at least, the importance of a mother to her son. This is obviously coupled with the simple “pick yourself up by your bootstraps” mantra that would have undoubtedly been chorus sung in the early 1940s. This being my first time viewing Dumbo, I’m quite amazing by how generally surreal the closing sequence turns out to be. The film really does deviate from traditional methods of storytelling, to the point that it seems to be more episodic in nature. It resolves in such a neat and rather outlandish fashion that one has to wonder what really happened when sweet ol’Dumbo leapt from the flaming building. Or maybe this is just me overanalyzing a sweet, good natured film.